In Track and Field, no individual award is more prestigious than the Bowerman Trophy. It’s the sport’s equivalent to the Heisman Trophy, and the Ducks are looking to go two-for-two this year on the awards. Since its inception in 2009, three Ducks have won this prestigious award, with nine finalists. Arizona has the second highest number of finalists with four; thus the Ducks have accumulated more than double the finalists of any other school. The Bowerman is presented annually by the USTFCCCA to the most outstanding male and female collegiate track & field athletes in the nation. Oregon’s Laura Roesler and Texas A&M’s Deon Lendore are the reigning winners of The Bowerman, which is named for legendary Oregon track & field and cross country coach, Bill Bowerman. Past winners include decathlon World Champion, Olympic gold medalist and world record holder Ashton Eaton (2010), 2012 Olympic silver medalist at 10,000m Galen Rupp (2009), 2011 IAAF World Champion at 1500m Jenny Simpson (2009), 2013 World Champion at 100m hurdles Brianna Rollins (2013), and 2012 Olympic bronze medalist at high jump Derek Drouin (2013). In total, the winners from the award’s first five years have won three Olympic medals, two World Championships and six World Championship medals. When considering finalists for the award, 13 individuals have earned a combined seven Olympic medals, four World Championships and 17 World Championships medals. Fan voting accounts for roughly 20% of the vote tally, with the other votes being split by the press, past winners, the 10-person Bowerman Advisory Board and select college administrators. Voting began a few days ago and ends on August 11th, with the award to be presented in December. Like the Heisman, The Bowerman is an important recruiting tool. Your vote for outstanding Duck National Champion athletes will further serve the goals of the best men’s and women’s teams in the country. 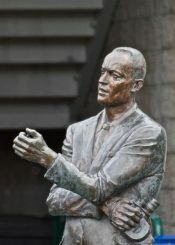 You can vote here: http://www.ustfccca.org/ustfccca-awards/the-bowerman#fanvote. As of yesterday, the two Ducks involved in the voting were third out of three finalists in the fan vote. It’s important that we support our Ducks, so vote today — it takes less than a minute. Marquis Dendy: Florida grad who triple jumped, long jumped and shared relay duty on Florida’s 4x100m team. A great all-around athlete who scored 40 individual points in both NCAA meets (indoors and outdoors) this season, won the USATF long jump, finished third in the triple jump and won the recent London Diamond League long jump against top pro athletes — Diamond League meets aren’t supposed to count in the voting, but they certainly have influence. He’ll compete in both vertical jumps in Beijing in less than a month at the World Championships. Shawn Barber: Set an NCAA record in the pole vault and won both indoor and outdoor titles, accumulating 20 points. He’ll represent Canada at the World Championships. 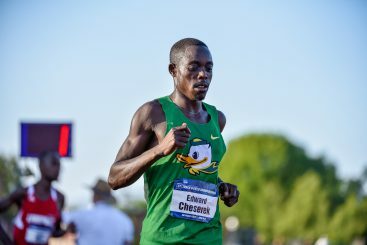 Edward Cheserek: Ran an amazing three sub-4:00 miles in 24 hours at the NCAA indoors and almost single-handedly brought the Duck men the national title by winning the mile, finishing second to teammate Eric Jenkins in the 3,000m, and anchoring the distance medley relay team to a first place finish. He also mightily contributed to the outdoor championship team title by winning both the 5000m and 10,000m titles. He amassed 40.5 points at NCAA meets — counting 2.5 out of 10 relay points. Amazingly, Cheserek won titles with three distances ranging from the mile to the 10,000m — that’s a Prefontaine- and Rupp-like performance. This is the second finalist appearance in The Bowerman for the Duck sophomore, which is a feat never before achieved in an athlete’s inaugural two seasons. Kendra Harrison: Outstanding Kentucky hurdler who placed in the hurdles (indoors and outdoors) ranging from 60m to 400m — something not done by most hurdlers. She accumulated 28 NCAA points for indoors and outdoors with her only slight stumble a 2nd place outdoor finish in the 400m hurdles. She will compete in the World Championships in Beijing as well. Demi Payne: Great personal story — a single mom who quit school and got a job, then was coaxed back into pole vaulting and set an NCAA record. Given that she no-heighted indoors, and only scored 10 NCAA points while Sandi Morris (Arkansas pole vaulter) scored 18, it’s a true mystery that Morris wasn’t selected. Call Payne the “feel good” nominee, but I don’t think she deserved to be on the ballot. Nonetheless, she finished third (behind Morris) at USATF and will compete in the World Championships. Jenna Prandini: Far and away the top talent in the group. She led her team to an improbable 2nd indoors finish — they were projected 7th — and to an upset title outdoors, scoring 49 points in one of the greatest single-season performances in NCAA history. She also held the world lead in the 100m and 200m earlier this outdoor season. Prandini ran all three short sprints, long jumped and handled relay duty. Prandini is truly an outstanding all-round performer and arguably the best female track athlete in Duck history. Oh, by the way, she’s only a junior. To cap off her incredible season, she won the USATF 200m title and will be competing in Beijing, with probably relay duty there, as well.